To say that in order to treat people with respect and dignity, society has to eliminate sexual complementarity from the definition of marriage actually contravenes the teachings of Jesus, whom Obama publicly claims to serve. First of all, President Obama's religious beliefs are irrelevant to equal protection under the law. In this country, we pride ourselves on the separation of church and state. One of these days, one of my brethren will end up in the oval office. It's a reasonable certainty that kashrut will not become the law of the land. We'll continue to enjoy lobster and baby-back ribs. Secondly, President Obama's religious beliefs are between him and his god. The only reason that they are even a subject of discussion is because of preposterous claims that the President is a Muslim. 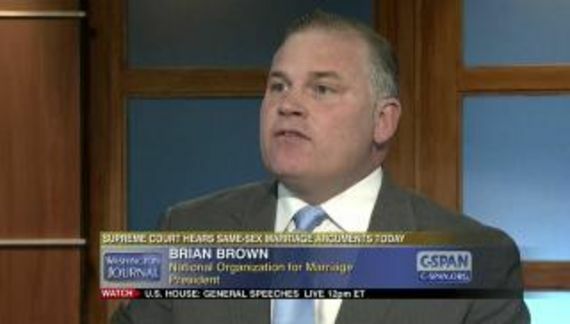 There are a considerable number of Christian clergy who are proponents of marriage equality. Why would, or should, the President be held to a higher standard? Finally, while the definition of marriage has changed many times over the last few thousand years, two things have remained constant. Marriage creates a marital estate and provides a way of raising children, if there are any. This idea of "sexual complementarity" [sic] is utter nonsense, gobbledygook made up to offer an argument in opposition to marriage equality. Ms. Higgins is just regurgitating the talking points that people like Frank Schubert were paid to create.